The most popular gathering place for family and friends has always been the kitchen. Today’s kitchen is transformed into an informal, interactive space where people can cook together, entertain, socialize play and work together. They are multipurpose living spaces that open and flow into other living areas and try to include the outdoors when possible. Kitchens today are about creating a life space that fits your personal style and functionability. There are lots of choices whether you are on a small budget or planning a top of the line upgrade. And remember a kitchen upgrade gives you the most return on investment at the time you sell of your home. Lighting is very important in new kitchens and their are many new and better choices of lighting now available. Some of the lighting upgrades we are seeing include… under cabinet lighting, recessed fixtures, and pendant lighting over kitchen islands. The trend is for a more transitional kitchen style that provides clean, simple, and contemporary lines. Generally we see and are using wood and stone with neutral colors that also have enhanced textural elements. According to a recent Houzz Report, 43 percent of homeowners remolded because they could no longer stand their old kitchen. Homeowners thought it best to turn the work over to professionals, such as kitchen designers, cabinetmakers, and general contractors to complete the kitchen remodel. 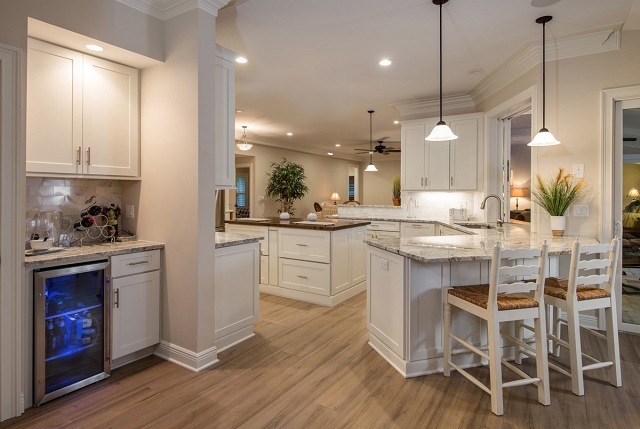 W.Stephens can help you transform your kitchen into a more open layout that provides more uses for your friends and family!